As Republican presidents go, Donald Trump isn’t particularly popular in Utah, one of the country’s most reliably Republican states. He won Utah in 2016 with only 45 percent of the vote, the worst performance of a GOP nominee since 1992, and his approval rating there still hovers around 50 percent. (Mitt Romney won 73 percent of the vote there in 2012.) Trump was in the state on Monday apparently hoping to win over Utah voters by announcing that he’s shrinking the boundaries of two national monuments there, Bears Ears and Grand Staircase-Escalante. “We’re going to Utah—we’re going to be doing something that the state of Utah and others have wanted to be done for many, many years,” Trump told reporters at the White House on Monday morning before leaving for Utah. “It will be one of the great, really, events in this country for a long time. So important for states’ rights and so important for the people of Utah.” But polling suggests Trump’s move may not be as popular in the state as he thinks. Bears Ears and Grand Staircase-Escalante were both created by Democratic presidents through executive orders, putting millions of acres of land in Utah off limits to grazing, coal mining, and oil and gas drilling. Trump has said he wants to “end these abuses” of presidential power and “return contol to the people, the people of all of the states, the people of the United States.” Trump announced a plan on Monday to shrink Bears Ears by 85 percent and to break up Grand Staircase-Escalante into three different monuments, reducing Escalante’s overall protected area by about half and specifically opening up much of it for coal mining that had been prevented when President Bill Clinton created the monument. Utah politicians have complained for decades about the heavy hand of the federal government, which they believe has prevented them from exploiting fossil fuel resources on public land within the state. In 2012, the state legislature went so far as to pass legislation demanding that the government hand over control of all federal land in Utah. Residents have staged a few protests against the Bureau of Land Management over limits on the use of federally protected wilderness land—with support from the same people took up arms to prevent the land agency from confiscating cattle owned by Nevada rancher Cliven Bundy. But despite these high-profile events, the view of public land management Trump is embracing isn’t any more popular than the president himself. A recent pollcommissioned by the Salt Lake Tribune and the University of Utah found that state residents opposed shrinking Escalante by a two-to-one margin, with only 27 percent saying they believed the monument should be reduced. Escalante was created in 1996 and is largely seen as a success, thanks to the increased tourism there generated by the monument designation. Polls on Bears Ears have been more mixed, which may in part be due to the fact that it was created just last year. In May, a poll commissioned by a Native American group in Utah found that 64 percent of residents favored keeping protections for the monument; four months later, a poll by local pollster Dan Jones & Associates found that 49 percent were in favor of shrinking its boundaries. A poll taken in January byColorado College’s State of the Rockies project, which prefaced the question on Bears Ears by explaining that the monument designation prohibits oil and gas development in the natural areas but keeps them open for recreational activities, found 47 percent support for the monument designation and 32 percent opposition. According to the latter poll, a growing share of Utahans also believes that oil and gas drilling on public lands should be strictly limited—31 percent of poll respondents this year, compared with 19 percent in 2013—and only 9 percent believe that public lands should be fully open to drilling, down from nearly 20 percent in 2013. The unemployment rate in Utah is currently 3.3 percent, among the lowest in the country, and that figure might help explain why state residents aren’t more interested in despoiling public lands for short-term economic gains. But there are other reasons. The state is the fastest-growing in the nation—and not just because of its high birthrate driven by large Mormon families. In-migration accounts for a significant portion of the growth. Much of the state’s appeal for newcomers comes from its ample outdoor recreational opportunities. People in Utah also have an intimate understanding of the downside of oil and gas exploration. Salt Lake City has some of the nation’s dirtiest air. It’s been in consistent violation of Environmental Protection Agency regulations for air quality, and on some days it competes with Beijing for the world’s worst air pollution. Local doctors and midwives have raised concerns in recent years that the air pollution is leading to an unusual number of stillbirths. The locus of support for shrinking the Utah monuments tends to be in sparsely populated southern Utah, places like San Juan County, where Bears Ears is located. But that support is almost exclusively among white people, who command a significant amount of media coverage and political attention but make up a minority of San Juan County’s 15,000 residents. The largest share of the residents is Native American—49 percent—thanks to the Navajo reservation within the county’s boundary. Latinos make up another 5 percent, leaving San Juan’s white population around 43 percent. Ninety-eight percent of local Navajos support preserving the Bears Ears monument designation. White residents of southern Utah have made something of a cottage industry of looting Native American sacred sites within Bears Ears, desecrating graves and making off with valuable antiquities. In 2009, federal law enforcement arrested 23 local residents, including a well-regarded local doctor, for looting offenses. They recovered more than 40,000 stolen Native American artifacts. In the five years before President Barack Obama designated Bears Ears a national monument, giving the area extra protection from the federal government, at least two dozen major looting incidents were documented there, including one in which someone took a saw to a major petroglyph. That’s one reason why the tribes had pushed to get the federal government to protect the sacred sites now covered by the Bears Ears monument, and why they’ve been so overwhelmingly supportive of it. It’s also why five tribes have vowed to sue the Trump administration as soon as Trump signs the executive order shrinking the boundaries of the Bears Ears monument. As the polls show, the tribes will have significant support from many state residents. 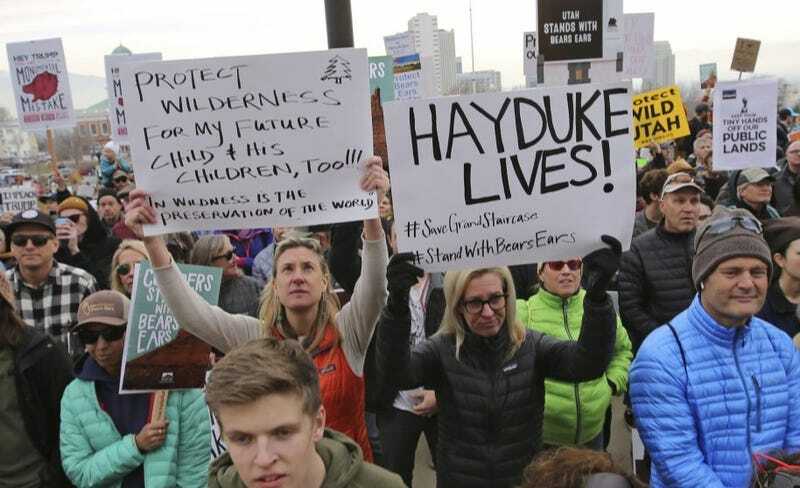 Utah isn’t a state known for a lot of public activism, but roughly 5,000 people showed up Saturday at the state capitol to protest Trump’s impending visit and executive order. This story was originally published by Mother Jones and appears here as part of the Climate Desk collaboration. Stephanie Mencimer is a staff reporter in Mother Jones’ Washington bureau. For more of her stories, click here. You can also follow her on Twitter.